In a large bowl, mix sugar, soy sauce, rice wine, sesame oil and ginger to taste. Add pork, green onion, cabbage, and garlic. Whisk together 1/3 cup water and 1 tsp. cornstarch to make a slurry to act as glue for wrappers. 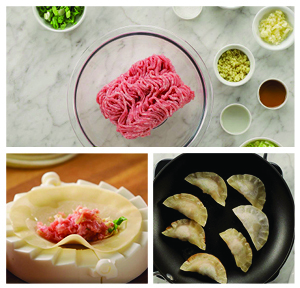 Using a potsticker press, fill dumpling wrappers with 1 heaping tsp. of filling. “Paint” the outer edge of the wrapper with slurry. Press firmly to close and seal dumpling. Place wrapped dumplings on a large tray. Cover with towel or plastic wrap to prevent drying while you make all dumplings. Heat nonstick pan over medium heat. Add oil to coat bottom of the pan. When the oil starts to get hot, add potstickers in a single layer. Cook for 1 to 2 minutes to start browning. When lightly browned on the bottom, carefully and slowly pour ¼ cup of water and immediately cover with the lid to trap steam. (Water may splatter, so use caution!) Let cook for 3 minutes. Then, open lid and let the potstickers continue to cook, uncovered until all water evaporates and the bottoms are crisp and browned. Whisk soy sauce, rice vinegar, sesame oil, lime juice, honey, and optional peppers for dipping sauce. Serve with potstickers, sprinkled with sesame seeds and green onions.